“Avígaíl has been part of the two-year-old classroom at Child’s Path since March 2018. When Avígaíl started in our room we never saw her smiling or enjoying play time with the other children around her. We introduced Avígaíl to the group of kids, and we prepared activities that improved the children’s relationships. She’s made great progress in our class! Now she likes to play with her classmates, she smiles all the time, and, during playtime, she talks to her friends! She has learned to share. Avígaíl’s language skills are appropriate for her age. She uses more words when she speaks with other children in the classroom. 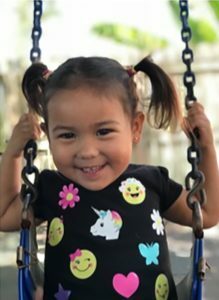 With her Mommy and Family’s help, Avígaíl is completely ready to not use a diaper at all anymore, and she only turned two in March 2018. Avígaíl recognizes some basic colors and shapes; she can match colors of different items; and she loves to sing during circle time activities. She likes story time, and when the teachers ask about the pictures on the page, Avígaíl is prompt with the answer!